Walking Batfish are some of the most unusual looking fish. They’re similar to other ambush predators like anglers. They don’t swim well, but are laterally compressed and spend most of their time using their thick pectoral fins to “walk” slowly on the sea floor. Walking Batfish are very difficult to feed in captivity and most require feedings of live shrimp for life. Since they spend most of their time on the substrate, provide an environment with mostly a soft, sandy bottom and little rock work. A mature deep sand bed can help supplement their diet with worms and other small invertebrates. Tankmates must be peaceful but not small enough to be eaten by the batfish. Triggers, puffers, and any fish that likes to nip on substrate or rocks do not make good tank mates. Similar species like appropriately sized anglers and scorpions make good tank mates. The species we typically see in the aquarium trade is Ogcocephalus corniger, the Longnose Batfish, which typically reaches 10″ in length. There are a few other species of Walking Batfish seen in the trade, but they can be difficult to identify. 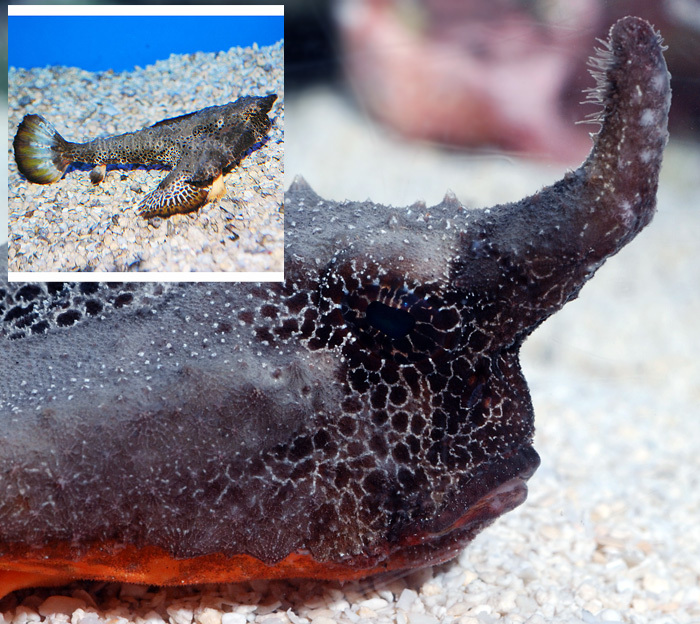 What makes it more confusing is that the Longnose Batfish actually has a short nose when it is a juvenile. O. nasutus can reach 15″ long, but keeps its short nose into adulthood.